Unique Photo's new partnership with Hensel, headquartered in Germany, will add hundreds of new high-quality, professional lighting products to Unique Photo’s vast inventory of in-store and online photography equipment and accessories. Unique Photo has established a dedicated sales team for Hensel products that will work alongside skilled sales representatives to support professional photographers and retailers across the United States. Unique Photo, New Jersey’s largest camera and video superstore, has been named the exclusive U.S. distributor of Hensel lighting products and equipment. The new partnership with Hensel, headquartered in Germany, will add hundreds of new high-quality, professional lighting products to Unique Photo’s vast inventory of in-store and online photography equipment and accessories. Unique Photo has established a dedicated sales team for Hensel products that will work alongside skilled sales representatives to support professional photographers and retailers across the United States. 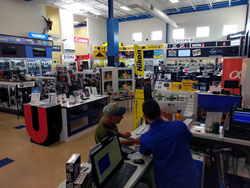 Founded in 1947, Unique Photo is one of the largest privately owned distributors of photo equipment and accessories worldwide with over 20,000 items available in-store and online through its 50,000-square-foot, state-of-the-art facility and warehouse on Route 46. The flagship store provides multi-media classrooms for educational workshops, a digital learning lab, professional photo lab, rental department, meeting space, gourmet coffee bar and WiFi lounge. Hensel was founded in 1963 and is based in Wuerzburg, Bavaria. The company develops, manufactures and distributes professional lighting systems and accessories for photographers and industrial users under the name “Hensel-Visit GmbH & Co. KG.” Among its best known products are the Cito 500, the fastest compact flash unit in the world, and the Hensel Porty, the first professional battery flash generator introduced in 1995. Today, Hensel is the largest German manufacturer of photographic lighting and develops and produces all flash units and continuous light sources in Germany. Unique Photo is a third generation, family-owned business that will be celebrating its 70th anniversary this year with exciting photography events, contests and excursions beginning this spring. Unique Photo is also home to the Unique® Photo Expo, New Jersey’s largest photography public trade show, coming on June 2-4 to the Unique Photo Superstore in Fairfield, NJ. Consumers can demo and purchase the latest products from leading manufacturers and take advantage of great 70th anniversary sales and over 40 free photography workshops.